Rockland 198 Spring St. 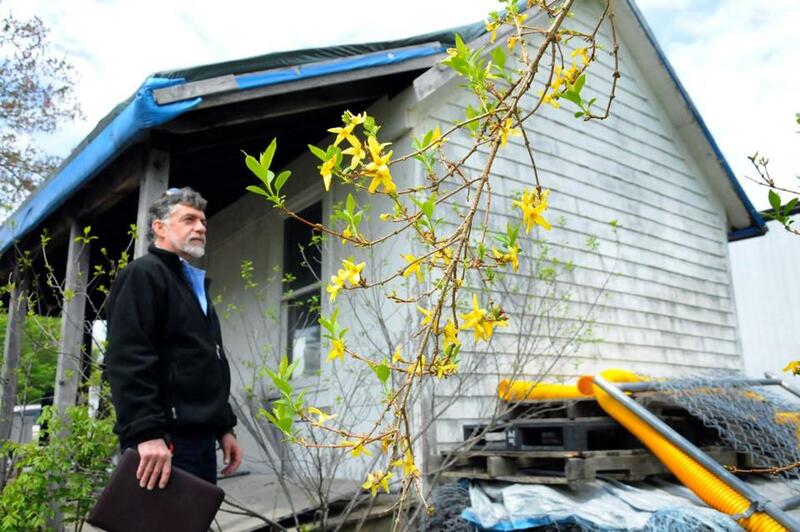 Built: 1876 | Historical Commission member James R. Paul Jr. closes the doors of the Tramp House, which is to be repaired and restored for new uses. The tiny one-story, one-room structure next to the ball fields on Spring Street in Rockland looks like a miniature house, with double-barn doors and a sagging farmer’s porch. For years, the Little League used it as a storage shed for equipment. Two years ago, the league planned to tear it down because it was in such disrepair. That’s when James R. Paul Jr., a member of the town’s Historical Commission, stepped in. The building, it turns out, is a “tramp house,” a phrase that describes its role as a temporary home for vagrants who wandered into town more than a century ago. 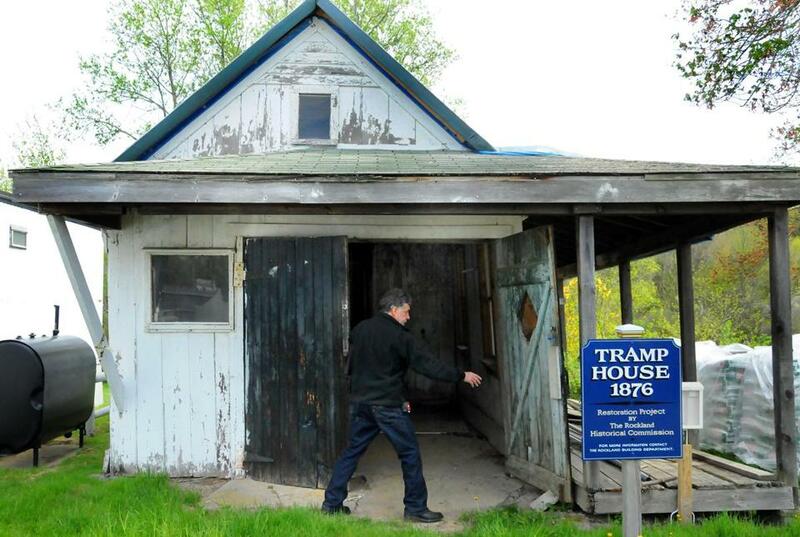 To history buffs, the tramp house represents an overlooked piece of American social history. They were small, simple structures that were barely furnished. As times changed, few survived. 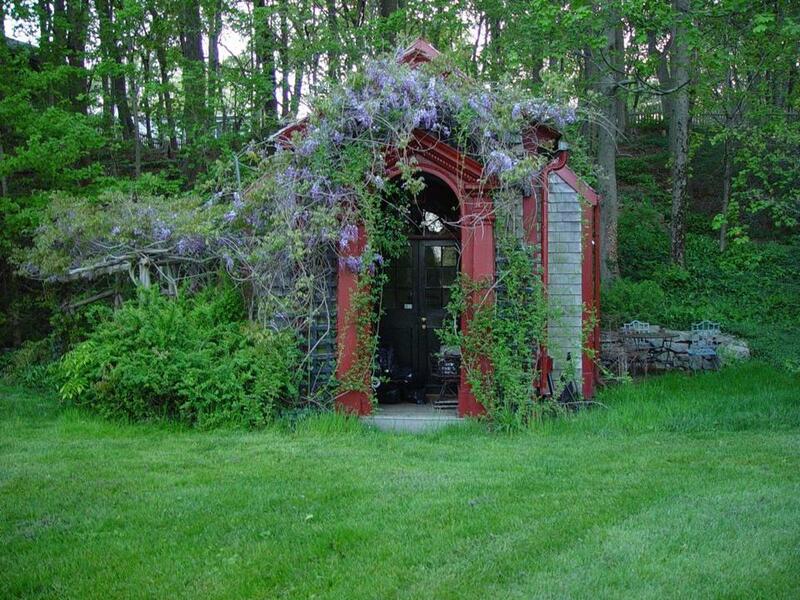 In Massachusetts, the Rockland tramp house — along with others in Weston, Middleton, Kingston, and Norfolk — are the only ones known to still exist. Paul spearheaded an article at the spring Town Meeting to spend $10,000 for restoring the building. “We want to keep it safe and rebuild it, and hopefully repurpose it,” said Paul. Around the turn of the previous century, tramp houses served a definite purpose and could be found in many communities across the state, especially along rail lines. Towns furnished their tramp houses with little more than mattresses, blankets, and a small wood stove. Guests might be given rations of crackers and water, and were often expected to chop wood in exchange for room and board. “They’re just little boxes,” she said. Local officials did not publicize the facilities because they didn’t want to attract more vagrants to their communities. But the structures were necessary to keep them from wandering the streets and knocking on people’s doors, begging for food. The five surviving tramp houses in Massachusetts were built in the latter part of the 19th century. The ones in Kingston and Weston are on private property; the others are municipally owned. This tramp house was built at the Weston Poor Farm in the late 1800s to accommodate tramps and migrant laborers. The economic crisis known as the Panic of 1873 contributed to a rise in unemployment and homelessness across the country. 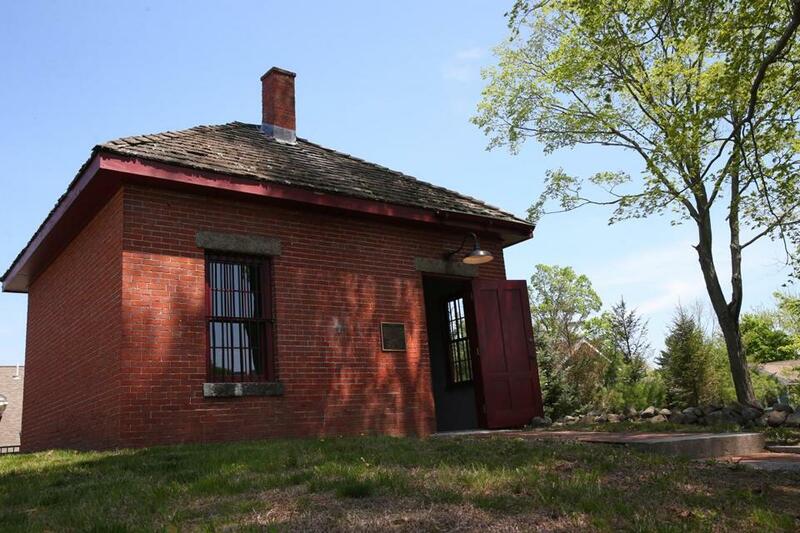 Around that time, a one-room outbuilding was constructed at the Weston Poor Farm to accommodate tramps as well as migrant laborers for the Massachusetts Central Railroad. It had a cement floor and a brick chimney, and measured 15 feet by 15 feet. According to records filed with the Massachusetts Historical Commission, it was used as a tramp house from 1874 to 1890, when the railroad was under construction. In 1878, records show that 568 transients took shelter there over the course of the year. In the annual town report, they were described as mostly young men who “say they are seeking employment . . . but the majority make tramping their business.” By 1880, the number had increased to 1,140. In 1922, the town voted to sell the poor house property at auction. It has been privately owned ever since, and the current owners use it as a storage shed. 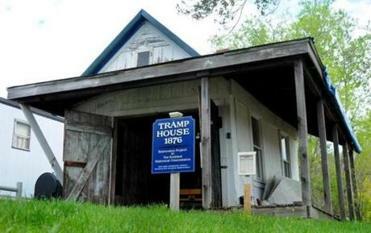 There are only five tramp houses still standing in Massachusetts, including this one that is used to entertain guests at a private home in Kingston. According to Meltsner’s book, 650 transients passed through Kingston in 1877, equivalent to about half the town’s population. Eventually a tramp house was built adjacent to the town’s poor house at 15 Landing Road. Tramps slept on mattresses and quilts, and were provided wood, candles, and matches. Meltsner found that the town provided shelter to 453 transients in 1896, and the annual town report said it was done “at small expense. The care of them is not agreeable, as any person may learn who undertakes it.” In 1923, the town sold the poor house property, which became a private residence, and the tramp house was converted into an art studio. In recent years, the tramp house has been used as a pool cabana and for entertaining guests. After the last train ran through Middleton in 1926, the Tramp House was used as a jail and then a police station. In its first year, the house served 476 itinerants, and in 1896 it served about 900. Many of them were Irish laborers who rode the rails looking for work in the mill cities of Haverhill, Lawrence, and Lowell. Town officials allowed them to stay overnight, and in the morning, they would “roust ’em out of town,” said Henry Tragert, president of the Middleton Historical Society. After the last train ran through Middleton in 1926, the building was turned into a jail. It also served briefly as a police station, but that didn’t last for long. According to town lore, police officers complained that it was too cold inside. Since the 1980s, the town has put a lot of work into restoring it. Though the building is empty, a plaque posted on the front explains its unusual history. “Now we have a little museum, I guess you could call it,” said Tragert. Norfolk Town Hill. 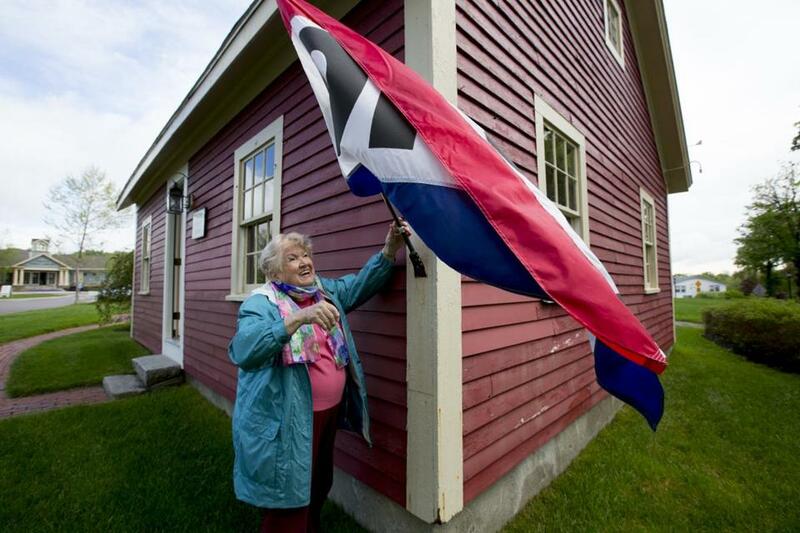 Built: 1886 | Thelma (Moore) Ravinski of the Norfolk Historical Commission hangs the “open” sign on the tramp house, which is located in the center of town. The red building on a prominent spot on Town Hill looks like a quaint one-room schoolhouse. Few people know its history. The tramp house sign was stolen a few years ago, and a new sign is kept under lock and key, displayed only when the building is open for special events, she said. 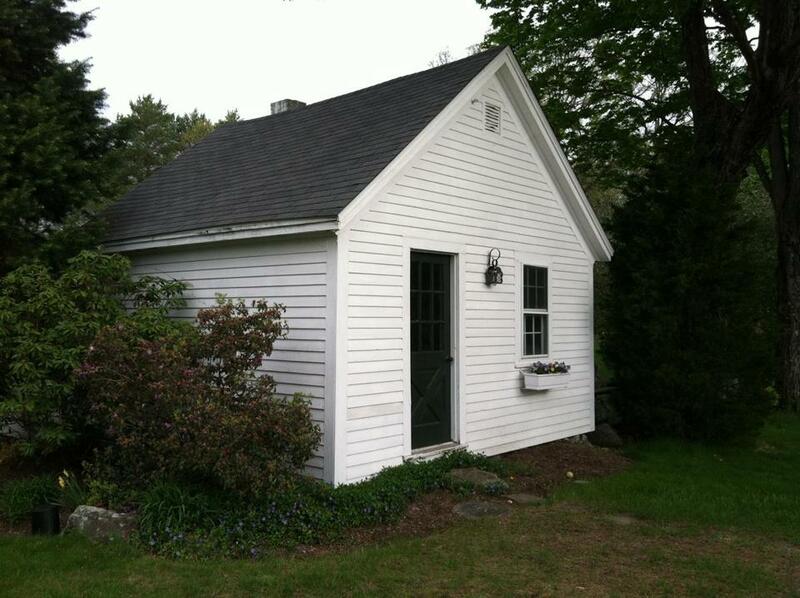 According to Massachusetts Historical Commission records, the Norfolk tramp house was built in 1886. By 1918, the School Department had taken over the building, which was used for classes until 1950. After that, it was used for VFW gatherings and storage for the Police Department. Today the Norfolk Historical Commission uses the space to host art shows and book sales. Rockland Historical Commission member James R. Paul, Jr. walked past the 1876 Tramp House on Spring Street. Rockland’s tramp house is next to the town almshouse, and both were built in 1876. Paul said the two buildings are significant because they were precursors to the welfare system of today. The entire property is listed on the National Register of Historic Places. The almshouse opened in October 1876, and the tramp house was erected a month later due to “the great increase of that class of humanity.” It cost the town $160 to build. At the rear is a garden, where “tramps who stayed here would grow food for the poor house,” said Paul. According to Meltsner’s book, the Rockland house served 564 transients in 1900 and 396 in 1904. Today, the property is owned by the School Department. It leases the building to the North River Collaborative, an educational organization that serves special-needs students. At April’s Town Meeting, when voters asked questions about the tramp house article, Paul handed them a flier explaining its historical significance. The $10,000 will pay for some much-needed repairs to the chimney, roof, porch, and structural beams. The exterior also could use a fresh coat of paint. Once the house is restored, Paul said, it could be a venue for a farmers market. He also wants to revitalize the garden in the back. He’s considering printing Rockland Tramp House T-shirts to drum up support. “I hope to turn it into a community effort,” he said.